ALBUQUERQUE, N.M. – If Alex Mirabal had his druthers, freshmen on the offensive line would be far down the depth chart, where they’d absorb knowledge and build strength in anticipation of one day seeing the field. Marshall’s current offensive line has defied his preferences. The results after a 12-game regular season have been a surprise. “I have not started a lot of freshmen, at all,” the Thundering Herd offensive line coach said. “You always have seniors and juniors. It takes a while from a strength development standpoint and a mentality standpoint for those guys to catch on. Marshall (7-5) will play this Saturday against Colorado State (7-5) in the Gildan New Mexico Bowl in Albuquerque. 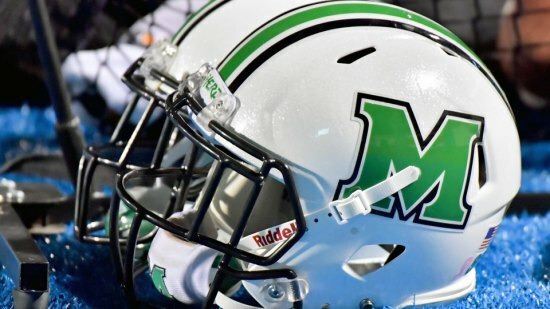 Herd fans have witnessed Marshall’s quintet of linemen, but the ESPN nationally televised audience will see a senior-less group up front: one junior, one sophomore and three redshirt freshmen. Overall, MU’s three starting freshmen offensive linemen – left tackle Will Ulmer, right guard Alex Mollette and right tackle Tarik Adams – have started 50.2 percent of the team’s possible offensive snaps. That is a staggering number, but the group has compensated for its lack of size and development with athleticism and enthusiasm. Circumstances changed Mirabal’s preseason plan. He knew he would likely need Adams, a 6-foot-3, 288-pounder from Valdosta, Georgia, to see significant time right away. But he anticipated Mollette, a 6-3, 295-pounder from Suwannee, Georgia, to be a rotational player with versatility. Ulmer, a 6-5, 290-pounder from Richmond, Kentucky, was initially the third option at left tackle, and likely would not see serious playing time in 2017. By the end of the regular season, Ulmer, Mollette and Adams had combined for 2,187 offensive snaps. And they had thrived. Marshall is tied for second nationally in sacks allowed with eight – or 0.67 per game – with three other teams, one of which is Colorado State. The Herd allowed eight sacks in 411 pass attempts, while the Rams allowed the same number in 407 pass attempts. Sure, there are areas of improvement. Marshall ranked No. 12 out of 14 Conference USA teams in rushing yards per game, and the run game averaged 3.75 yards per rush attempt. But there are no seniors in this group, so their best football lies ahead. Sophomore center Levi Brown played 866 of 872 snaps – 99.3 percent – and junior guard Jordan Dowrey played 599 snaps (68.7 percent). It is hard for Mirabal to nitpick. He lauded the group’s toughness. They were challenged by bigger, more experienced defensive linemen and never backed down. They kept their quarterback, Chase Litton, off the ground and healthy. Litton has attempted all 411 of those throws, and by remaining injury-free Marshall protected the redshirt of freshman quarterback Isaiah Green. And the Herd did it with a pair of freshmen tackles on the edge, and another freshman at right guard who opened the season as the backup center and bounced around the offensive line based on need. “We play so much with our tight end detached, where they’re not attached to the line of scrimmage, and we throw the ball so much that it made this situation extremely unique,” Mirabal said. “But these guys were not fazed.